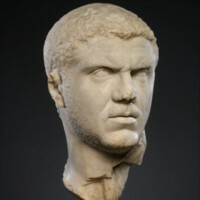 The marble portrait of the emperor Caracalla is a fragmentary bust, which is carved in the round, and portrays an adult male possibly in his mid-thirties. He has a round face that is accentuated by a thick muscular neck. His hair is short and has closely adhering individual curls, with visible traces of pigment scattered on the masses of hair. His face is individualized, and the flesh appears smooth and without blemishes. His eyes, which are emphasized by his prominent brow ridges, are large, rounded, and deeply set in their sockets. He has a thick plebeian nose with a furrow across the bridge, an open mouth with slightly parted curved lips and a cleft chin. His square jaw is accentuated by a beard which extends over the upper neck and the underside of the chin. He has creases on his forehead, wrinkles on his brows, and furrows on the bridge of his nose, all working together to render a frowning and somewhat sinister facial expression. Overall, this portrait is an indication of the importance of using visual language to communicate political propaganda. 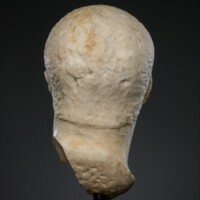 Sculpture was influential in legitimizing the emperor’s supremacy and publicizing the reach of his domain in ancient Rome. 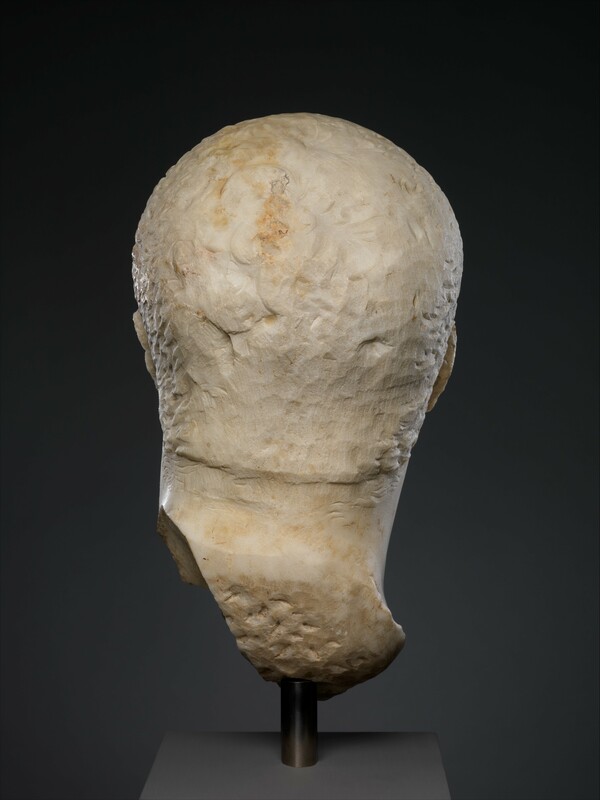 Copies were widely dispersed to all the Roman provinces, and served as a constant reminder of the identity of the imperial authority. 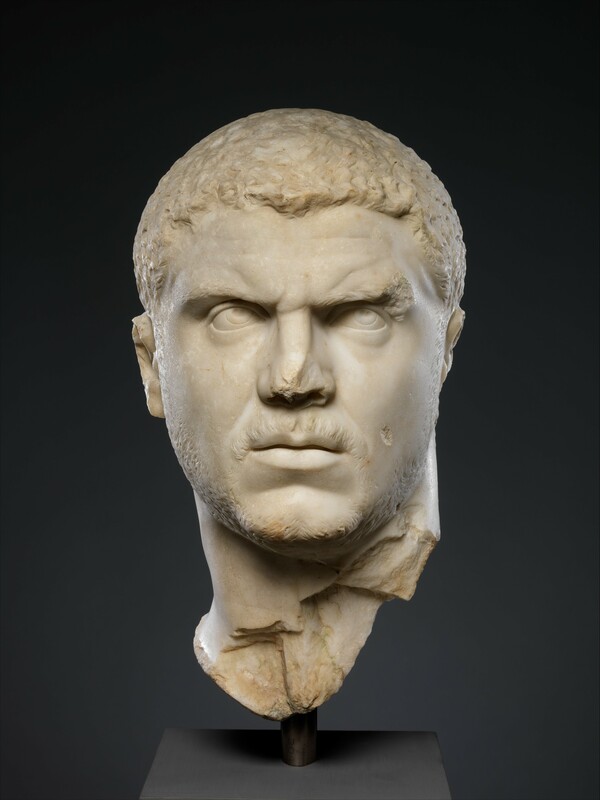 This marble bust is a depiction of the Roman emperor Caracalla (r. 211-217 CE) and it served to communicate the emperor’s power, his military prowess, and his vigilance. According to Janson’s History of Art, portrait statues of Roman imperial figures were erected in public places and were intended to support the legitimacy of the emperor’s powers. The Augustus of Primaporta (fig. 7.29), for instance, which is a marble sculpture of the Roman emperor Octavian Caesar Augustus (r. 31 BCE – 14 CE), was a visible testament to Augustus’s claim to authority. This sculpture can be complemented by the marble portrait of the emperor Caracalla since the two served a similar purpose; they both visually testified the two emperors’ skill in matters of combat and their control over the vast Roman empire. Augustus is shown wearing armor and holding a baton, while Caracalla is depicted as a no-nonsense ruler of iron-fisted determination. 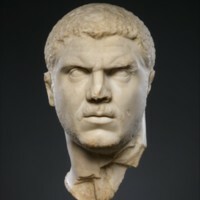 Both images clearly signify the essentiality of portraiture as a political tool for imperial rulers in ancient Rome. 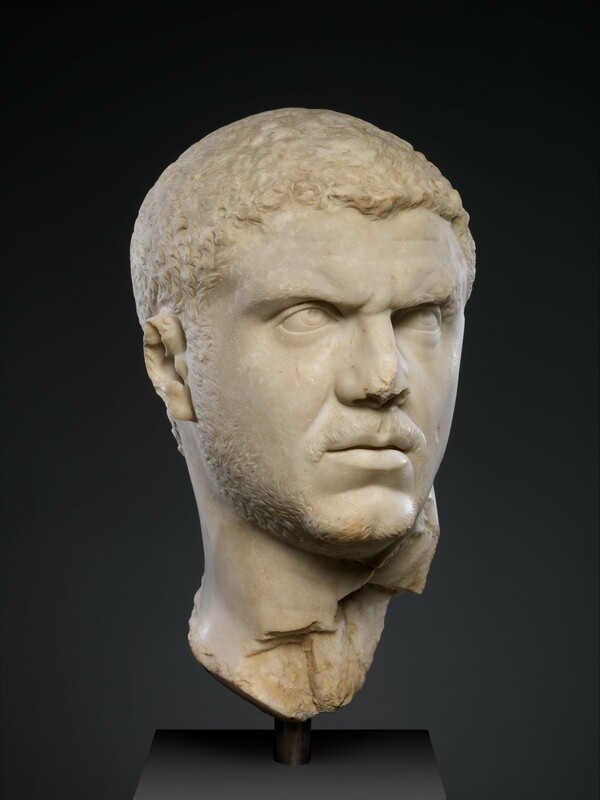 “Marble portrait of the emperor Caracalla,” accessed April 22, 2019, http://metsurvey.kenyoncip.org/items/show/60.